If “liturgy” is a dirty word, this book is for you. If liturgy is a way of life, this book is for you. In my Christian journey, I fall somewhere in between on the liturgy scale. I was not raised in a liturgical (or non-liturgical) church, but somewhere along the way, I got the impression that being liturgical was a bad thing. Recently, I’ve come to appreciate the beauty and meaning in the liturgy, and the Book of Common Prayer has become a companion to my (mostly) daily spiritual readings. 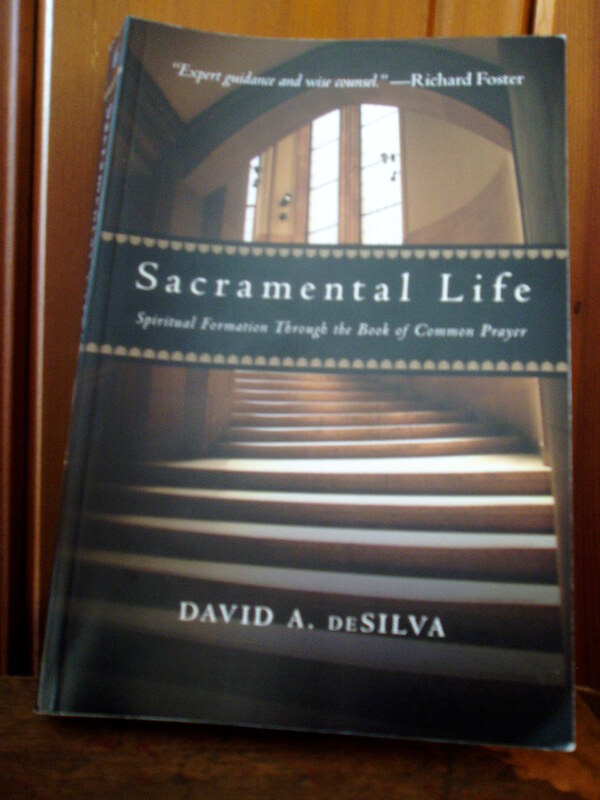 The same friend who gifted a Book of Common Prayer to my husband and me also gave us this book, Sacramental Life by David A. DeSilva. In it, DeSilva explains and personalizes elements of the Book of Common Prayer for the everyday saint, offering daily application of the sacraments. The author divides the book into four sections: baptism, the eucharist, marriage and death. What surprised me most is the application of all of these sacraments and rituals into all of life. Baptism, for example, is not merely a one-time event but something we live out in our daily walk. And death is not just a reason to grieve lost loved ones but a reminder of our mortality and a call to honor the examples of those who’ve gone before us. Each chapter (there are 45) ends with an activity or thought-provoking question to cement the lesson. I will confess that I did not take as much time as I would have liked to reflect and/or complete the activity. But this is not a book that will gather much dust on my bookshelf. I will pick it up again soon. And if you are at all curious about liturgy, Anglicanism and a deeper look at the sacraments, I’d encourage you to pick up Sacramental Life.